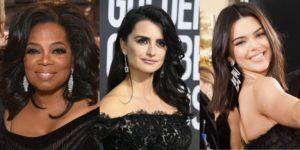 There were some pretty impressive Hollywood engagement rings in the last year. Here is our first installment of 2017’s celeb engagement rings that all got a “YES”! There is one very distinct trend….the Pear Shape Diamond. It will be interesting to see if the demand for the Pear Shape Diamond will increase in the coming months. 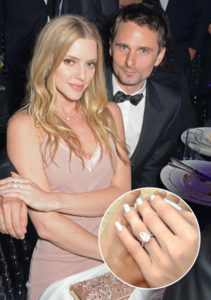 The Muse rocker Matt Bellamy popped the question to model Elle Evans while the two vacationed in Fiji. She said yes to a Pear shape solitaire, set in Rose Gold on a thin Diamond band. Equestrian Karl Cook proposed to Actress Kaley Cuoco on her birthday. 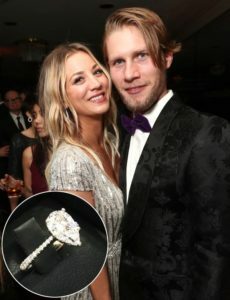 In the tearful video that went viral, Kaley said yes to a Pear Shape Diamond set on a reverse graduated diamond band. The most anticipated engagement of the year by far was Prince Harry to Meghan Markle. 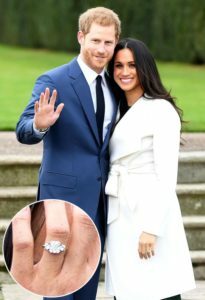 Prince Harry custom pieced together a ring for Markle, sourcing the Cushion Shape center stone from Botswana and placing it with two Round diamonds from his mother’s collection, the late Princess Diana. He set the unique and sentimental 3 Stone ring in Yellow Gold. 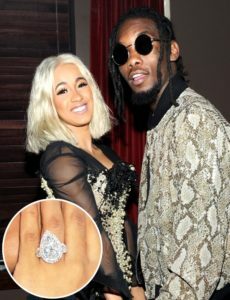 Rapper Offset proposed to Cardi B on stage with an 8ct Pear Shape diamond, that is. If that wasn’t enough, the 8ct center stone has a double halo, of white and pink diamonds and 2 half carat Pear Shape diamond side stones. The ring is reported to be worth half a million dollars. John Stamos proposed to model Caitlyn McHugh with a 3 stone ring. The center is an Emerald Shape diamond with Baguette side stones. 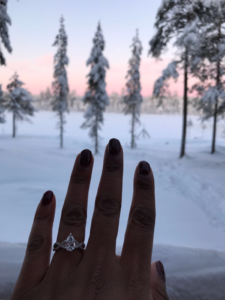 Chris Zylka proposed to Paris Hilton on top of a snow covered mountain and takes the title for the biggest engagement rock of 2017. The ring boast a 20ct Pear Shape diamond, reportedly worth 2 Million dollars, with a halo and split shank. 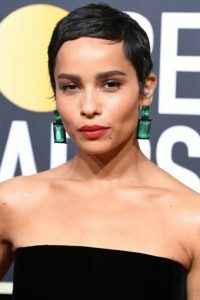 While color appeared back on the red carpet for the SAG Awards, one thing remained the same….Statement Earrings! 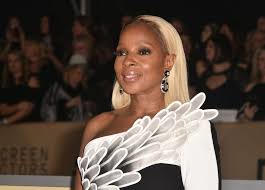 And much like the Golden Globes, the mixing of Diamonds with colored precious stones was again the trend. 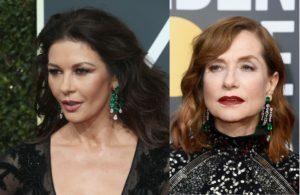 Here are some of Hollywood’s leading ladies in some of the night’s most spectacular jewelry looks. Congratulations to NYCWD client, Dinos. 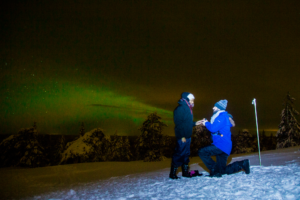 Who planned a beautiful proposal under the Northern Lights! NYCWD wishes you all the love, health and happiness! 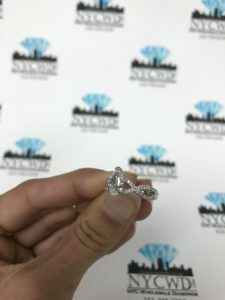 I am proud to announce my 30th Year providing the best in fine diamond jewelry quality and pricing here in the New York Diamond District. My reputation, that is second to none in the industry, brings the most pride and satisfaction. 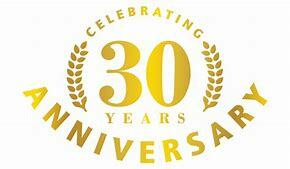 It is you, our treasured clients that has made this all possible! Thanks to all of you, we have hundreds of sparkling online reviews, referrals, and have had the pleasure of servicing multiple generations. I will never say no, when I can say Yes to a client’s desires. We love to hear from you, so we invite you to share in the joy. Send us your photos, your stories and we will share them on our social media. Maybe you have traveled, celebrated a monumental life occasion or even passed down some of your most sentimental pieces. We would love to hear from you and see where your NYCWD pieces have been! We are looking forward to what is to come this year and very excited to share with you very soon our completely new website! We are working hard to bring you an easier and more efficient way to shop and take advantage of all of the wonderful designs and services we offer! A 910-carat diamond, which is believed to be the world’s fifth largest diamond, has been unearthed in Lesotho. The stone was discovered in Letseng mine by Gem Diamonds, a UK miner with operations in Botswana and Lesotho. Clifford Elphick, Gem Diamonds’ chief executive, says the find is a “landmark discovery” and is the largest diamond ever mined by the company. Gem Diamonds shared rose 15% after news of the find. This is just the latest find by Gem Diamonds. In Aug. 2006, the company mined “Lesotho Promise,” a 603-carat diamond in Letseng mine. At an auction in Antwerp, Belgium less than two months later, Lesotho Promise was sold for $12.3 million—around $20,000 per carat. 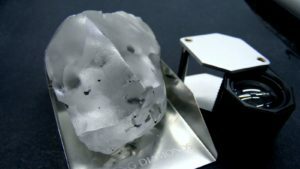 Analysts say the newly discovered 910-carat diamond could be worth as much as $40 million.